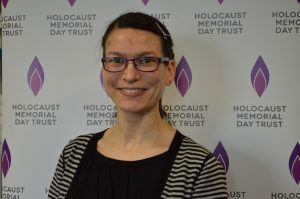 I joined the Holocaust Memorial Day Trust (HMDT) as Chief Executive in February 2012. 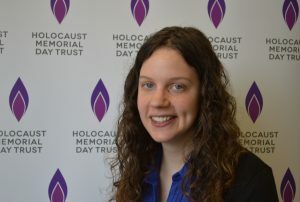 I have overseen the growth of Holocaust Memorial Day around the country and a hugely increased media presence. I believe passionately that everyone, regardless of age or background, should know about the Holocaust, Nazi Persecution and the subsequent genocides, and should set aside time to remember all those who suffered. I feel fortunate to be working for an organisation that enables people to do this, that encourages people to consider their own responsibilities, and that puts the life stories of those who were murdered and those who survived at the centre of commemorations. Before joining HMDT, I worked in a number of other charities, mainly in roles that involved political lobbying, policy development and stakeholder engagement. 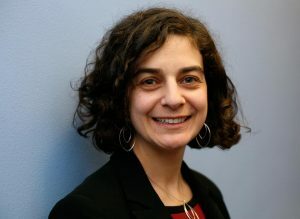 As Head of Outreach, I oversee the outreach and education team, ensuring the reach and impact of local HMD activities continue to grow year on year. I first joined HMDT as Education Officer in June 2013. I have been dedicated to Holocaust education for a long time as I feel very strongly that we need to both learn and teach about the Holocaust and subsequent genocides to remember the victims, honour the survivors, and to try to learn lessons from the past. I am fortunate to be working in a position at HMDT that allows me to continue learning and teaching about the Holocaust, and hope to inspire and motivate others to do the same. I have completed a doctorate in Holocaust Studies at Royal Holloway, University of London, and published a book based on my research in 2017, entitled The Female Administrators of the Third Reich. I am also an educator for March of the Living UK. In addition, I have an MA in Holocaust Studies from UCL, and am a Fellow of the Imperial War Museum in Holocaust Education. I have worked at HMDT since September 2015, and in my role as Head of Communications I am responsible for overseeing all external communications, media strategy, HMDT's digital output and parliamentary work. 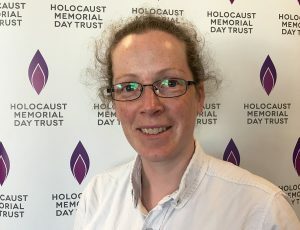 I am excited to be working with an organisation that encourages people from all walks of life to think about history and examine ways in which they can explore the themes of the Holocaust and subsequent genocides. My BA in History at Royal Holloway, University of London encouraged a study of 19th and 20th century cultural and social history across Europe and the UK. It is important to me that as a society we look to the past for lessons on how to live better lives today. Before joining HMDT I worked for a number of arts and heritage organisations both in London and the West Midlands, where I am originally from. I joined HMDT in July 2017 as the Finance and Resources Manager. In my role I oversee the Finance, HR and all round operations of the charity, supported by the Operations Team, to ensure the charity is sustainable and runs smoothly. Before joining HMDT I worked at a charity promoting the education of prisoners. I love working for charities that have an ethos of hope and understanding and that is why I am so excited to join the team here at HMDT. HMDT promotes learning lessons from the past and using these to ensure we make improvements for future generations. I joined HMDT as Outreach Officer in September 2015. My role is to encourage new and existing HMD activity organisers to mark HMD and to coordinate the team to record, analyse and evaluate local HMD activities. I manage the Volunteer programme and HMD Youth programmes. Educating people about genocide is one preventative measure to ensure that history does not repeat itself. I am determined to inspire and motivate people to get involved with HMDT as I have been able to see from my varied experiences how raising awareness can effectively implement change. I have campaigned for the inclusion of all people to provide them with the same basic human rights and believe that people can only help the plight of another group when there is open communication and understanding of the complex issues as well as a contribution to the solution from the oppressed group. Before joining the HMDT team, I studied Media at Nottingham Trent University. Alongside my studies, I was the National Campaign Coordinator for Aegis Trust and President of the Amnesty International Society. 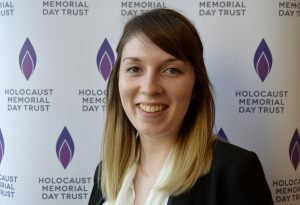 I joined the Operations and Finance Team at Holocaust Memorial Day Trust in July 2018. In my capacity as an Operations Officer I provide everyday operational support to the HMDT staff team, and I act as the first point of contact for telephone and email enquiries. I hold a lifelong interest in history and a belief in the importance of spreading awareness of, and learning from, mistakes of the past. Because of this, I feel fortunate to be able to aid HMDT in its aim of promoting commemoration of Holocaust Memorial Day. Before starting at HMDT I worked in a variety of administrative positions, including in logistics and research. I recently completed my studies at Queen Mary University of London. I joined HMDT as Local Government HMD Officer in November 2018. My role focuses on engaging with local and regional government to support them in marking Holocaust Memorial Day in their communities. Local authorities act as champions for their communities and have an essential role to play in uniting, safeguarding and educating their constituents. Through supporting them to mark Holocaust Memorial Day, I believe that communities become stronger and better placed to challenge discrimination and prejudice by learning lessons from the past. Before I joined HMDT, I worked in political consultancy, working across local, regional and national government, and before that worked in the press office of a human rights charity which supports survivors of torture. I hold a degree in Law from the London School of Economics, with a specialism in international human rights law- a subject I am passionate about. I am a Fellow of the René Cassin-AJA Fellowship Programme and volunteer at a local refugee charity in my spare time. I was first introduced to HMDT’s work when I took part in the Youth Champion programme and am proud to be contributing to an organisation with such an important purpose. I joined HMDT in September 2018 as a Gedenkdiener. 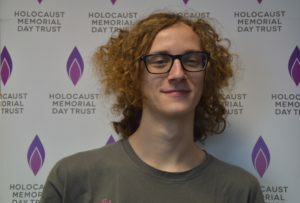 The organisation Gedenkdienst sends about 20 young men and women from Austria all over the world, to work in the field of Holocaust education and commemoration for one year, as part of their civil service. As a Gedenkdiener at HMDT I mainly support the Outreach Team, which includes working with survivors and helping to develop future projects. Furthermore I assist the whole HMDT team wherever I am needed. I am very excited to have the opportunity to learn about the Holocaust and other genocides and to contribute my knowledge and energy to these crucially important topics. I am most looking forward to meeting survivors and listen to their stories personally, as it is an inspiration to pass their message on and fight inequality, racism and hatred wherever they may occur. I joined HMDT as Communications Officer in January 2016. 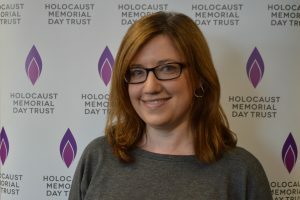 My role includes working closely with survivors of the Holocaust, Nazi Persecution and more recent genocides, managing HMDT's social media and working with the Communications Manager to support media engagement with HMD. I feel privileged to be able to support people who have been affected by genocide to tell their stories. Sharing the testimony of those who have experienced genocide is one of our most powerful tools in educating others and preventing such atrocities from occurring again. 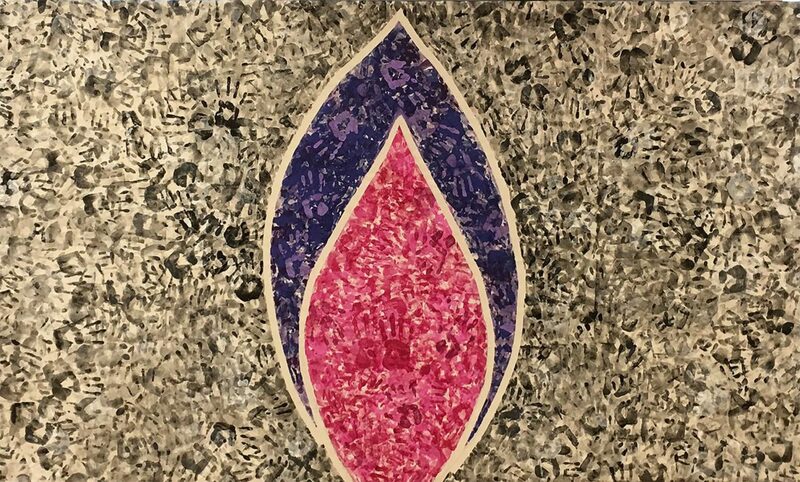 As fewer survivors of the Holocaust are able to share their stories themselves, we face the challenge of preserving this testimony and finding other, creative ways of sharing it with others. Before joining HMDT, I worked for an organisation based in the North West, which included supporting vulnerable people facing homelessness. I have a BA in English Literature from Lancaster University. 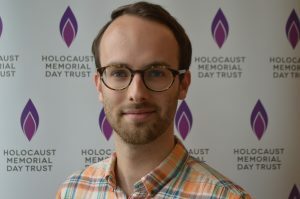 I joined the Holocaust Memorial Day Trust team as Education Officer in April 2017. 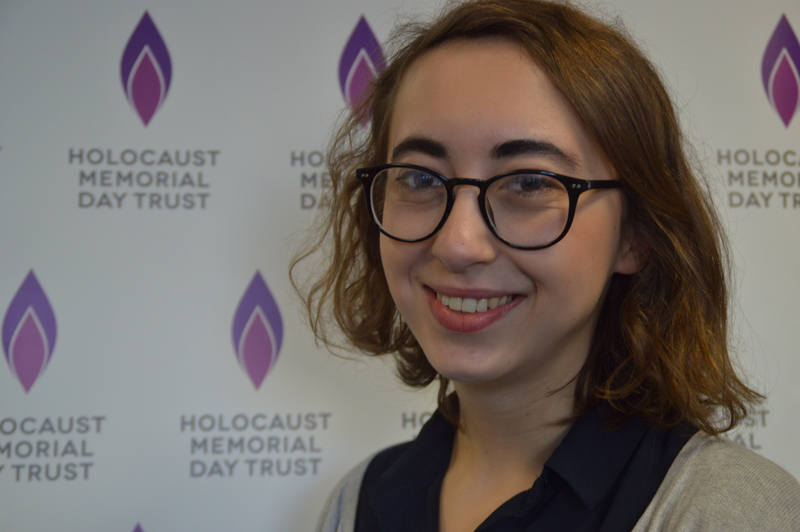 My role is to create resources that support educators in schools, colleges, universities and community groups across the UK to teach young people and adults about the Holocaust, Nazi persecution and subsequent genocides. I work in partnership with lots of organisations, and coordinate our life stories programme each year, sharing testimony from genocide survivors, witnesses and relevant contemporary stories. I firmly believe in the power of genocide education and learning from survivor testimony to broaden young people’s minds, and that by learning about humanity’s darkest moments we also discover its brightest potential. I aim to encourage people to think and question, and to use the knowledge and emotion gained from these stories to take action - learning lessons from the past to create a safer, better future. Prior to being appointed as Education Officer I was the freelance Arts Coordinator for HMDT from 2013 – 2017, and my background is in creative education and arts participation. I have worked in a south London secondary school, and for museums and cultural organisations including Southbank Centre, Foundling Museum and the Royal Central School of Speech and Drama. 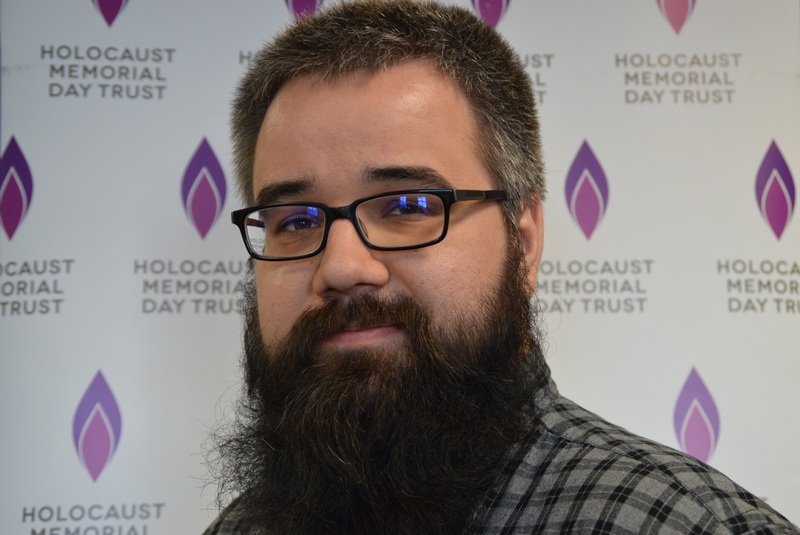 I joined the Holocaust Memorial Day Trust as Operations Officer in March 2017. I provide operational support to the HMDT staff as well as administrative support for the CEO and the Board of Trustees. Prior to HMDT, I held a variety of positions in education and training including administration, teaching, student services, events organisation, sales, marketing and management. I have also completed a short course in International Human Rights Law at the University of Nottingham and I feel fortunate to have the opportunity to combine my varied work experience with my recent studies. I firmly believe that commemorating the past is the first step in working towards a better, safer future. I joined HMDT in April 2018 as a Project Officer. 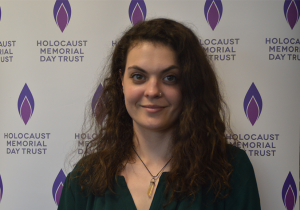 In this role I work within the Communications Team to support the delivery of HMD. I am also responsible for co-ordinating the planning of HMD 2020, which will mark the 75th anniversary of the liberation of Auschwitz. Having completed a Masters by Research that looked at the nature of Holocaust memory in Britain and South Africa, and having worked at the Holocaust Centres in South Africa, I have a longstanding interest in Holocaust commemoration and education. I have also worked with youths in South African townships, using participatory film to encourage their engagement with human rights and promote youth advocacy within their communities. 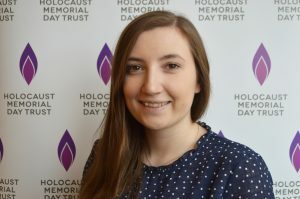 I am honoured to have the opportunity to work at an organisation that is keeping the memory of the Holocaust, Nazi Persecution and subsequent genocides alive, as I believe it is so important to educate the public about the dangers of prejudice. HMD provides us all with the opportunity to reflect upon what is happening in the world today and to think about how we can use the lessons of the past to shape our futures.